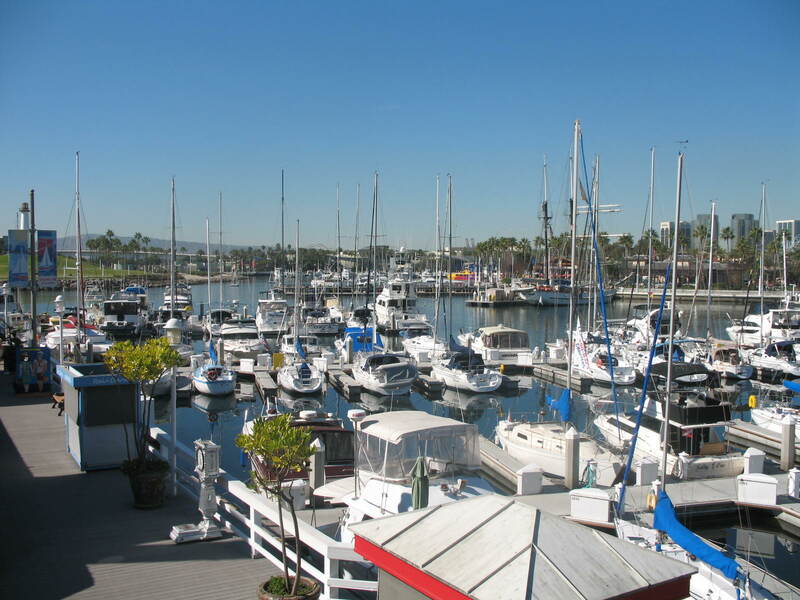 The Rainbow Harbor/Marina is one of the best destination harbors in Southern California. 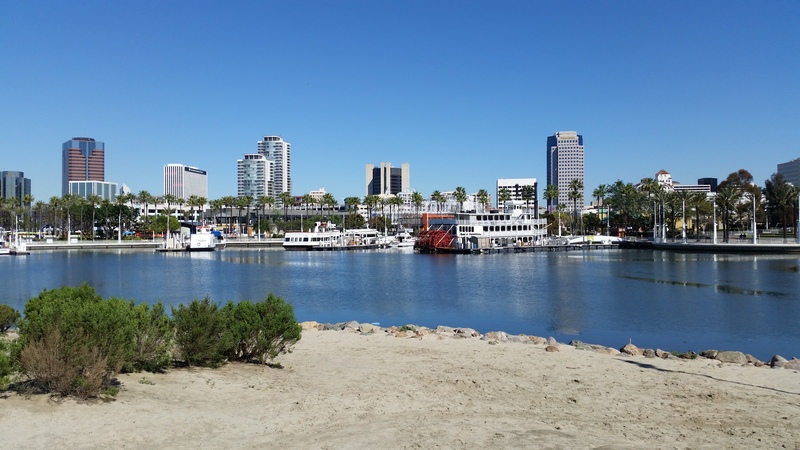 Located at the end of the Pike in Downtown Long Beach, there is never a shortage of fun activities. From the Aquarium of the Pacific, to whale watching with Harbor Breeze Cruises, to nights at Shenanigan’s or the Sky Room, there is something for the whole family! Parts of Rainbow Harbor opened in 1983 with the development of the Downtown Marina (now known as the Shoreline Marina). A small basin for recreational boats was carved out of the harbor, and was a quiet place to keep a small boat until the rest of the area was developed. In 1995, Rainbow Harbor/Marina was opened, and the recreational basin became affectionately called the “Fishbowl”, due to its location surrounded by Shoreline Village. Rainbow Harbor/Marina was split into the recreational side on the east (Rainbow Marina) and a side for larger commercial vessels on the west (Rainbow Harbor). The Rainbow Marina (Fishbowl) today is no longer strictly recreational, as there are several small commercial operations. The main office for Rainbow Harbor is located at 200 B Aquarium Way, next to Pierpoint Landing. It is on the west side of the harbor, by the rear of the Aquarium of the Pacific. There is parking available in the paid parking lot in the back, or you can pull your boat up to Dock 1, right in front of the office. They are open 7 days a week from 8am-4:30pm, and are closed on New Year’s Day, Thanksgiving, and Christmas Day. To book a guest slip, inquire about permanent slips, or report any safety concerns or maintenance issues or problems with any of the launch ramps you can give them a call at (562) 570-8636. The fax number is (562) 570-8640. The slips in Rainbow Marina range in size from 30′-45′, with end-ties ranging from 69′-90′. All of the slips and end-ties have dockboxes, water and power available. The 30′ and 35′ slips have 30a/120v service, and the 40′ and 45′ slips have 50a/120v service. There are two gates leading to the marina-one in Shoreline Village by Shenanigan’s Irish Pub, and one on the public dock. A key is needed to open these, and the keys are only available to current boatowners in the marina, their guests, and guest or transient boaters. Boatowner restrooms and showers are located in Shoreline Village and also require a key to get in. Guest (or transient) slips are available for rent as well as permanent slips. To reserve a guest slip call the Rainbow Harbor office at (562) 570-8636 between 8am and 4pm. They will require your documentation/registration, the declarations page of your insurance showing at least $100,000 in liability insurance, a copy of your ID, and a Visa or Mastercard. Guest slips can be reserved up to 30 days in ahead of time, and advanced reservations are highly recommended during the summer and holidays. 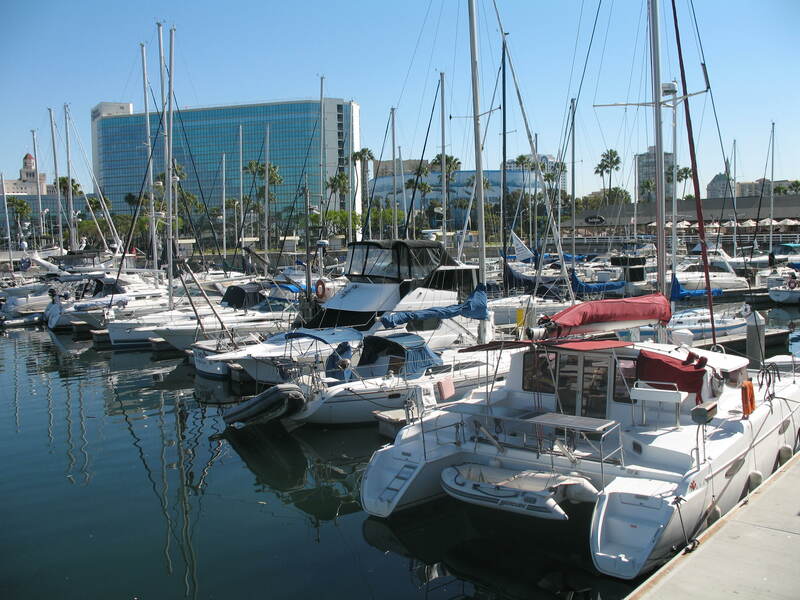 Renting permanent, or year round slips, in Rainbow Marina is unique because of its location. It is in the middle of Shoreline Village and is a high traffic area and very popular on the nights and weekends. There are also large events several times a year which impacts not only the docks and waterways, but also the roads around the marina. Many people are turned off by this, and look toward the Shoreline Marina and Alamitos Bay Marina for a quieter place to keep their boats. However, the tenants that are in Rainbow Marina have been there for years and have created a small community on the docks. They are all very welcoming, and are quick to chat and offer helpful tips and tricks or watch each other’s vessels when out of town. Permanent slips require current registration in the slip owner’s name, insurance with at least $100,000 in liability coverage and also naming the city as “Additional Insured”, first month’s rent, and a security deposit equal to one month’s rent. The vessel will also need to be inspected before the slip is issued. To get a slip, call the Rainbow Harbor office Monday-Friday from 8am-4pm. Please note that slips will not always be immediately available, and there may be a waiting list for the slips at various times throughout the year. There are two public docks in Rainbow Harbor, totaling over 600′ of dock space. Dock 10, or “Parker’s Dock”, is outside of the harbor in front of Parker’s Lighthouse restaurant. It is an “L” shaped dock over 400′ long, with 3 pumpouts on the south end and 1 water hose. The other public dock is Dock 8, located inside Rainbow Marina near the Yardhouse. This dock is over 200′ long, but does not have any pump outs or water. Both docks have a 3 hour maximum time limit and are open 24 hours per day, but are closed during some special events, such as the Grand Prix. As mentioned before, there are also commercial operation in Rainbow Marina. The biggest and oldest is Marina Sailing. They have been around since 1962, and with Rainbow Marina since 1999. They are a sailing club that offers sailing instruction and vessels for hourly rentals or multi-day charters. 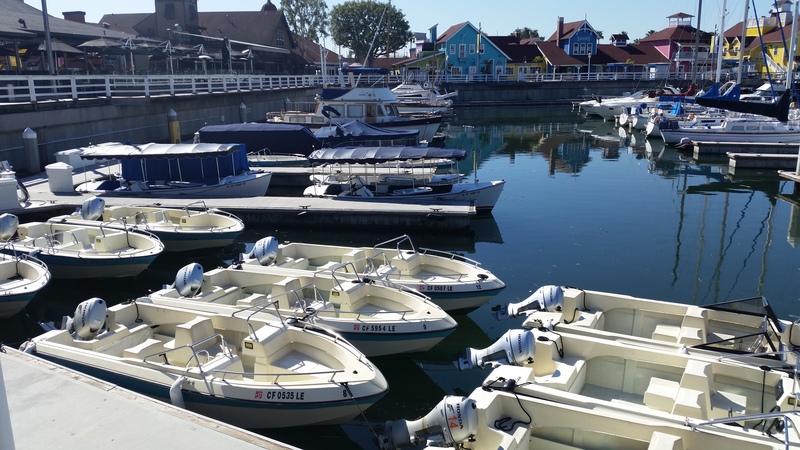 They have 19 vessels in the marina, ranging from 26′ to 46′. Their Long Beach office is located in Shoreline Village at 429 Shoreline Village Dr. Ste M. For more information you can call them at (562) 432-4672. They also have locations in Marina Del, Rey, Channel Islands, Redondo Beach, Newport Beach, and San Diego. 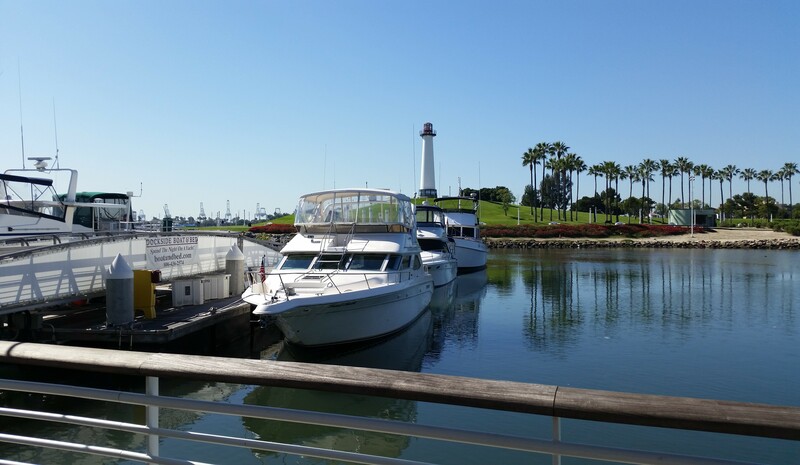 Long Beach Boat Rentals is a small boat rental company and one of the most popular things to do in Long Beach. They are located at 401 Shoreline Village Dr., behind the Yardhouse at the top of the public dock. They have several power boats to choose from, including electric Duffy boats, a 21′ pontoon boat and personal watercraft for rent. You don’t need a captain’s license or any prior experience to rent any of these, just a credit card and an ID. Advanced reservations are encouraged, especially during the summer when they are routinely booked solid. They can be reached at (562) 491-7400. The electric Duffy boats are perfect for a relaxing family outing on the water, as they come with ample seating space, power outlets, and a table large enough for a meal with extended family. They are also easy enough to operate that a first time user could feel comfortable taking one out of the marina to do some exploring around the Queen Mary or near shore area. For those who need a little more speed, Long Beach Boat Rentals also rents power boats with 9.9-40hp outboards. These can reach speeds of 30mph, but must be kept under 5mph in the marina. However, once past the harbor area you can open up the throttle and really see how fast they can go. Jet skis are also available for rent. There are a limited number of these, though, and they go fast. It’s recommended to make a reservation ahead of time or, if you are making last minute plans, to get to their dock as soon as they open to secure one or two for later in the day. Island Trader Charters is run by Capt. Chuck Brown off of his 36′ Cheoy Lee power boat “Island Trader”. He has several decades of experience in the maritime industry, and offers private charters, sunset cruises, cruises to Catalina Island, burials at sea, whale watching, and overnight accommodations on his boat. He can be reached at (714) 625-6074. 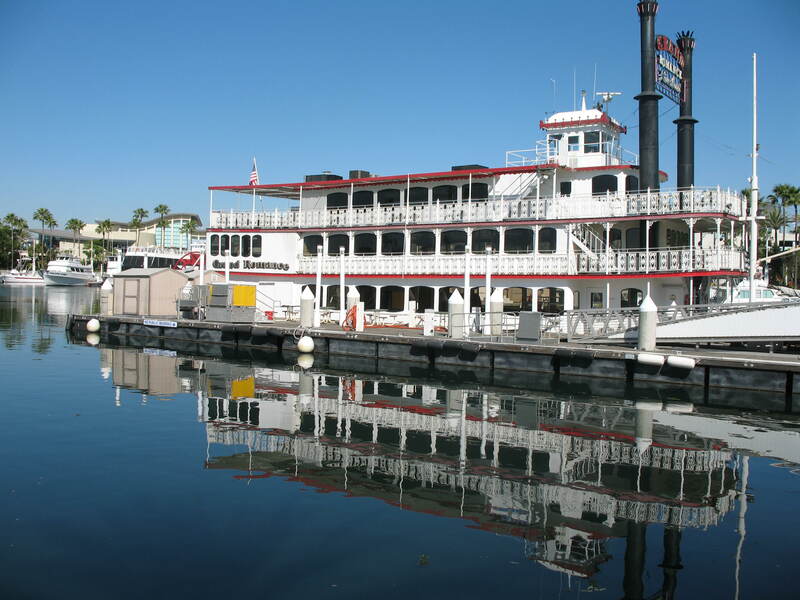 Spirit Cruises is located at Dock 9, near Parker’s Lighthouse restaurant a,nd Louisiana Charlie’s restaurant. They office cruises of the Port of Long Beach and the near shore area, private party cruises, and wedding cruises. Call (310) 584-8080 for more information. Rainbow Harbor is the commercial side of Rainbow Harbor/Marina. It includes Docks 1-7 and the Pine Ave Pier. The Pine Ave Pier 180′ long and is used almost exclusively for transient vessels. The rest of the docks are leased by various businesses, including fishing charters, whale watching, and tall ships. To inquire about commercial leases, call the Rainbow Harbor/Marina office at (562) 570-8636 and ask for the commercial RFP packet. There is no waiting list for commercial dock space; instead they will keep all proposals on file and choose the one they think best fits the harbor. Each dock is 150′ comes with water and 50a 125v/250v and 3 phase service, along with a dedicated pump out. In addition to dock boxes, each commercial operation has one to two sheds to store larger items. There are no lockable gates on the docks. 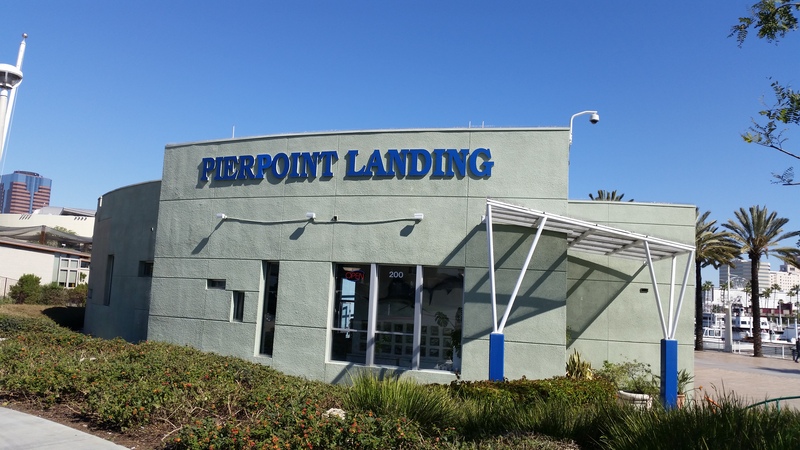 Pierpoint Landing is a family owned fishing charter company that has been around for over 50 years. It was started by Whitey Ashley in the 60s, and is now owned by Don Ashley and Curtis and Veronica Wegener. They have a lease for all of Dock 1 in Rainbow Harbor, and run 1/2 day, 3/4 day, and multi-day fishing charters. They also rent out available dock space to recreational boaters. Their office is located at 200 Aquarium Way, and has snacks, drinks, ice cream shirts, hats, and bait available for purchase alongside tickets. Parking available in the paid lot behind their office, or offsite in a gated parking lot. Guests using one of their vessels can get a parking pass at the ticket counter. For more information you can give them a call at (562) 983-9300 or visit their office in person. Harbor Breeze Cruises is located on Docks 2 and 3 in Rainbow Harbor and Dock 7 in Rainbow Marina. They are the largest whale watching company in the area, and also offer harbor cruises, private party cruises, and burials at sea. 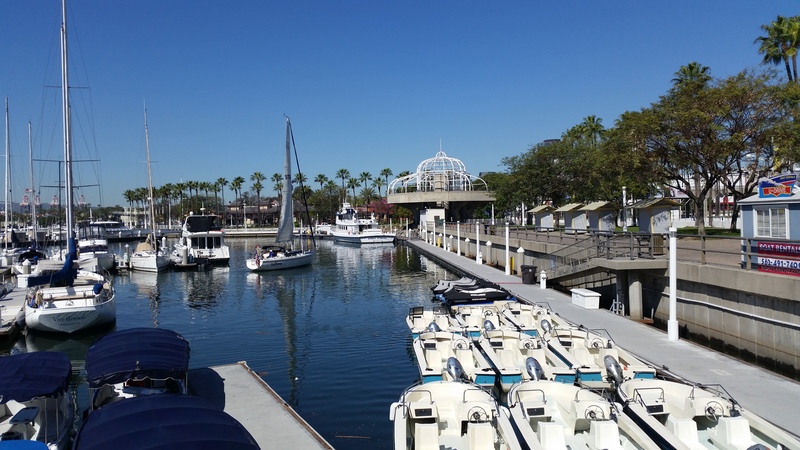 Parking is located at the Aquarium parking structure across the street from their dock. They can be reached at (562) 983-6880. The Tall Ship “American Pride” is also located on Dock 3 in Rainbow Harbor. It is a 130′ tall ship that is a faithful recreation of a 19th century three masted schooner. It is available for educational trips, summer camps, and whale watching. For more information call (562) 970-8800. The Grand Romance is a 100′ long paddle wheel river boat on Dock 4 that boasts three decks, a dance floor, dj booth and full bar set up. They are available for private parties and events, as well as “murder mystery” dinners, New Year’s Eve and Fourth of July cruises. For bookings or more information call (562) 912-5665. Dockside Boat and Bed is a unique attraction on Dock 5. It has several vessels available for rent as a “floating hotel”. This is a great alternative if you are looking for something a little different than a usual hotel experience. 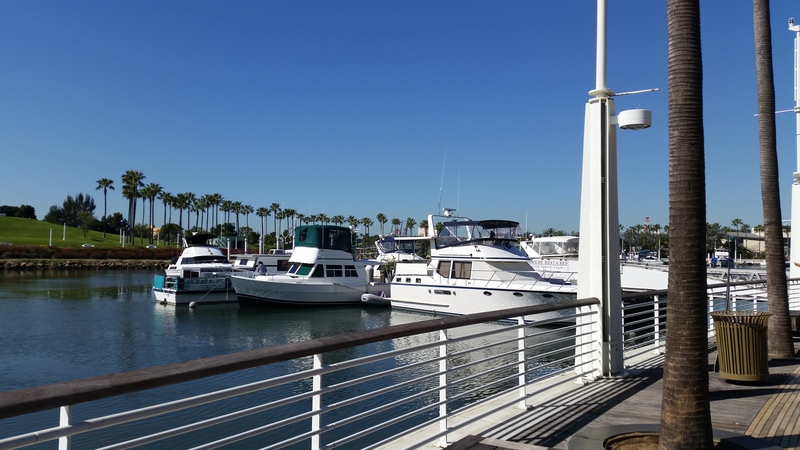 The dock is located in the middle of Rainbow Harbor and is the perfect location for someone checking out not only the Pike and Downtown Long Beach but also the Convention Center or the New Year’s Eve fireworks. 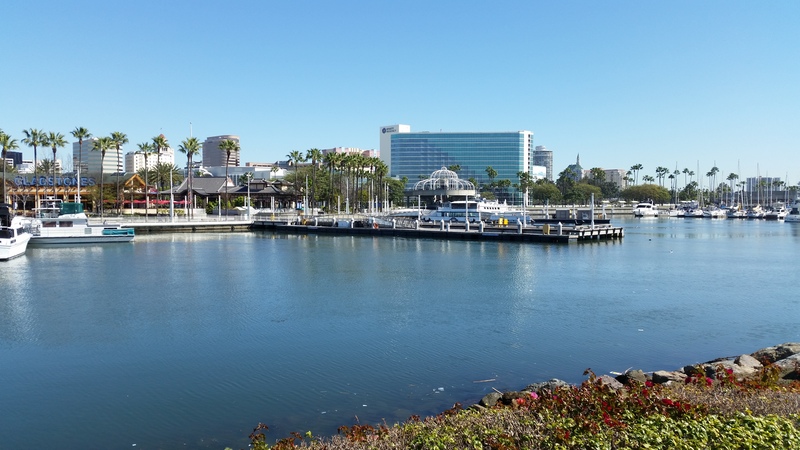 They are also a great place to stay during the Long Beach Grand Prix, as they are just steps away from the action. Parking is located in the lot behind Pierpoint Landing or, for an additional fee, at the valet lot on the Pine Ave Circle by PF Chang’s. For more information call (562) 435-3111. Sharing Dock 5 with Dockside Boat and Bed is Burials at Sea by Capt. Johnnie Lee. Capt. Lee has a 45′ power boat named the “Great Faith”, and is also available for boating lessons. Dock 6 is currently rented out by Hornblower Cruises. They provide private party cruises as well as cruises for corporate and school events. They can be reached at (310) 301-6000. The Pine Ave Pier is a 180′ long pier located in the center of Rainbow Harbor. The west side has a floating dock that is used for transient vessels as well as the occasional special event. There is 30a/120v and 50a 125/250v service available on the dock, as well as water and a pump-out. At the head of the dock is Gladstone’s Restaurant and Tokyo Wako. There is no lock on the swing gate, but the area is regularly patrolled by the Long Beach Marine Patrol. The east side of the dock is currently empty, and is only used for emergencies. However, the city will be constructing an additional 180′ long dock to be used as another public dock, which will make it easier for visiting boaters to get to the restaurants in Rainbow Harbor. 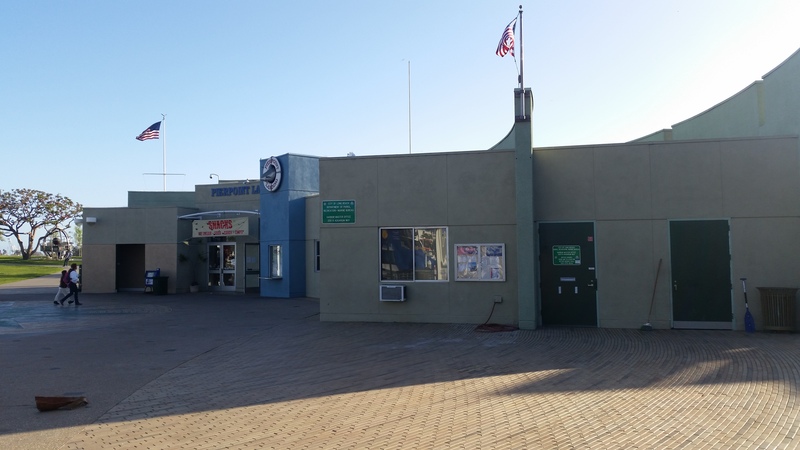 To book dock space on the Pine Ave Pier, call the Rainbow Harbor office between 8am and 4pm at (562) 570-8636. The AquaLink and AquaBus are two water taxis that have stops in Rainbow Harbor and Rainbow Marina. The AquaLink shares Dock 4 along with the AquaBus and the Grand Romance riverboat. The AquaBus also stops at Dock 7 and Dock 9 in Rainbow Marina. 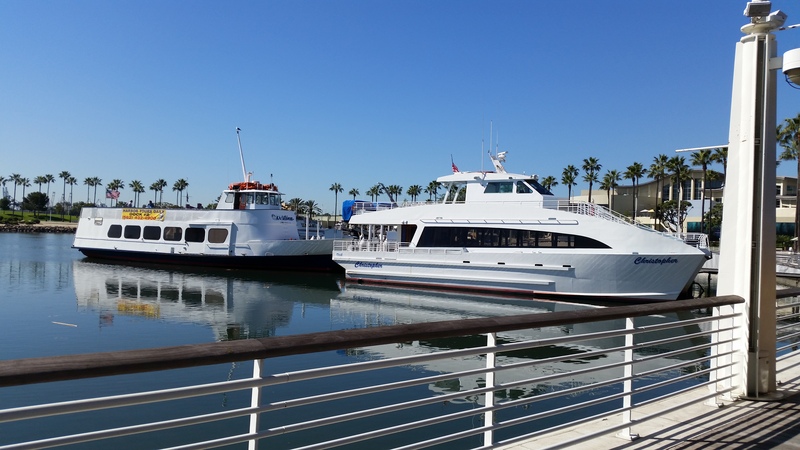 The AquaBus runs from Rainbow Harbor to the Queen Mary and Hotel Maya, while the AquaLink runs from Rainbow Harbor to the Alamitos Bay Marina, with a stop at the Belmont Pier along the way. Both are run by Long Beach Transit, and can be reached at (562) 591-2301.